Diplomacy by Chavez : Blog Of The Nation Relations between Venezuela and Colombia get even more complicated. 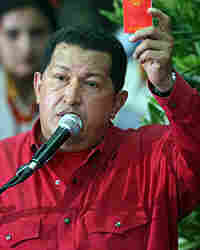 It's safe to say that if Venezuelan leader Hugo Chavez were a perfume ("Diplomacy: by Chavez") he would smell... strong. (Maybe woodsy too). In his latest diplomatic scuffle, Chavez's attempt at hostage mediation between the government of Colombia and FARC rebels has ended in nothing but insults, and "frozen" relations between Colombia and Venezuela. Today, the Ambassador of Venezuela will be here to explain what the spat is about, but you can do a little advanced reading on your own here.